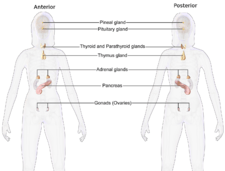 The endocrine system is the collection of glands of an organism that secrete hormones directly into the circulatory system to be carried towards distant target organs. The phenomenon of biochemical processes' serving to regulate distant tissues by means of secretions directly into the circulatory system is called endocrine signaling. 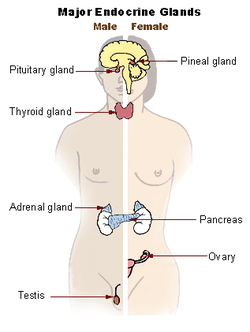 The major endocrine glands include the pineal gland, pituitary gland, pancreas, ovaries, testes, thyroid gland, parathyroid gland, and adrenal glands. The endocrine system is in contrast to the exocrine system, which secretes its hormones to the outside of the body using ducts. The endocrine system is an information signal system like the nervous system, yet its effects and mechanism are classifiably different. The endocrine system's effects are slow to initiate, and prolonged in their response, lasting from a few hours up to weeks. The nervous system sends information very quickly, and responses are generally short lived. In vertebrates, the hypothalamus is the neural control center for all endocrine systems. The field of study dealing with the endocrine system and its disorders is endocrinology, a branch of internal medicine. Special features of endocrine glands are, in general, their ductless nature, their vascularity, and commonly the presence of intracellular vacuoles or granules that store their hormones. In contrast, exocrine glands, such as salivary glands, sweat glands, and glands within the gastrointestinal tract, tend to be much less vascular and have ducts or a hollow lumen. A number of glands that signal each other in sequence are usually referred to as an axis, for example, the hypothalamic-pituitary-adrenal axis. As opposed to endocrine factors that travel considerably longer distances via the circulatory system, other signaling molecules, such as paracrine factors involved in paracrine signalling diffuse over a relatively short distance. 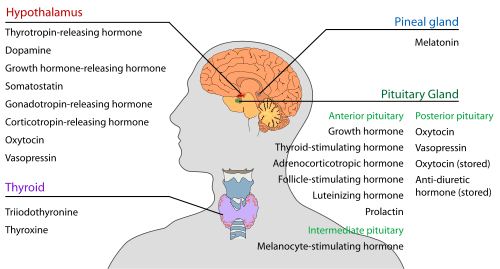 The word endocrine derives from the Greek words ἐνδο- endo- "inside, within," and κρίνειν krinein "to separate, distinguish". The pituitary gland (or hypophysis) is an endocrine gland about the size of a pea and weighing 0.5 grams (0.018 oz) in humans. It is a protrusion off the bottom of the hypothalamus at the base of the brain, and rests in a small, bony cavity (sella turcica) covered by a dural fold (diaphragma sellae). The pituitary is functionally connected to the hypothalamus by the median eminence via a small tube called the infundibular stem or pituitary stalk. .
Oxytocin and anti-diuretic hormone are not secreted in the posterior lobe, merely stored. NPY Increased food intake and decreased physical activity. It can be associated with obesity. Reduces smooth muscle contractions and blood flow within the intestine. The pancreas is a mixocrine gland and it secretes both enzymes and hormones. β Islet cells Intake of glucose, glycogenesis and glycolysis in liver and muscle from blood. α Islet cells Glycogenolysis and gluconeogenesis in liver. PP cells Self regulate the pancreas secretion activities and effect the hepatic glycogen levels. Make cervical mucus thick and impenetrable to sperm. Stimulates PO3−4 release from bones, thereby increasing blood PO3−4. Overall, small net drop in serum PO3−4. In 1998, skeletal muscle was identified as an endocrine organ due to its now well-established role in the secretion of myokines. The use of the term myokine to describe cytokines and other peptides produced by muscle as signalling molecules was proposed in 2003. Signalling molecules released by adipose tissue are referred to as adipokines. 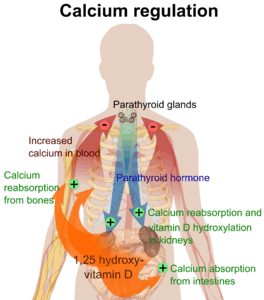 Extensive bidirectional interactions exist between the endocrine system and the immune system. Cortisol has major immunosuppressive effects, and dopamine has immunomodulatory functions. On the other hand, cytokines produced during inflammation activate the HPA axis at all three levels, sensible to negative feedback. Moreover, cytokines stimulate hepcidin release from the liver, which is eventually responsible for the anemia of chronic disease. A neuroendocrine system has been observed in all animals with a nervous system and all vertebrates have an hypothalamus-pituitary axis. All vertebrates have a thyroid, which in amphibians is also crucial for transformation of larvae into adult form. All vertebrates have adrenal gland tissue, with mammals unique in having it organized into layers. All vertebrates have some form of renin-angiotensin axis, and all tetrapods have aldosterone as primary mineralocorticoid. ↑ Endo K, Matsumoto T, Kobayashi T, Kasuya Y, Kamata K (2005). "Diabetes-related changes in contractile responses of stomach fundus to endothelin-1 in streptozotocin-induced diabetic rats". J Smooth Muscle Res. 41 (1): 35–47. doi:10.1540/jsmr.41.35. PMID 15855738. 1 2 3 Kaushansky K (May 2006). "Lineage-specific hematopoietic growth factors". N Engl J Med. 354 (19): 2034–45. doi:10.1056/NEJMra052706. PMID 16687716. ↑ Pentikäinen V, Erkkilä K, Suomalainen L, Parvinen M, Dunkel L (2000). "Estradiol acts as a germinal cell survival factor in the human testis in vitro". J Clin Endocrinol Metab. 85 (5): 2057–67. doi:10.1210/jcem.85.5.6600. PMID 10843196. ↑ Hould F, Fried G, Fazekas A, Tremblay S, Mersereau W (1988). "Progesterone receptors regulate gallbladder motility". J Surg Res. 45 (6): 505–12. doi:10.1016/0022-4804(88)90137-0. PMID 3184927. ↑ Massaro D, Massaro GD (2004). "Estrogen regulates pulmonary alveolar formation, loss, and regeneration in mice". American Journal of Physiology. Lung Cellular and Molecular Physiology. 287 (6): L1154–9. doi:10.1152/ajplung.00228.2004. PMID 15298854. 1 2 Pedersen BK, Febbraio MA (October 2008). "Muscle as an endocrine organ: focus on muscle-derived interleukin-6". Physiological Reviews. 88 (4): 1379–406. doi:10.1152/physrev.90100.2007. PMID 18923185. ↑ Ostrowski K, Hermann C, Bangash A, Schjerling P, Nielsen JN, Pedersen BK (December 1998). "A trauma-like elevation of plasma cytokines in humans in response to treadmill running". The Journal of Physiology. 513 (3): 889–94. doi:10.1111/j.1469-7793.1998.889ba.x. PMC 2231318 . PMID 9824725. ↑ Pedersen BK, Steensberg A, Fischer C, et al. (2003). "Searching for the exercise factor: is IL-6 a candidate?". Journal of Muscle Research and Cell Motility. 24 (2–3): 113–9. doi:10.1023/A:1026070911202. PMID 14609022. ↑ Frühbeck G (July 2004). "The adipose tissue as a source of vasoactive factors". Curr Med Chem Cardiovasc Hematol Agents. 2 (3): 197–208. doi:10.2174/1568016043356255. PMID 15320786. ↑ Turnbull AV, Rivier CL (January 1999). "Regulation of the hypothalamic-pituitary-adrenal axis by cytokines: actions and mechanisms of action". Physiological Reviews. 79 (1): 1–71. PMID 9922367. ↑ O'Connor TM, O'Halloran DJ, Shanahan F (June 2000). "The stress response and the hypothalamic-pituitary-adrenal axis: from molecule to melancholia". QJM. 93 (6): 323–33. doi:10.1093/qjmed/93.6.323. PMID 10873181. ↑ Tsigos C, Chrousos GP (October 2002). "Hypothalamic-pituitary-adrenal axis, neuroendocrine factors and stress". Journal of Psychosomatic Research. 53 (4): 865–71. doi:10.1016/S0022-3999(02)00429-4. PMID 12377295. ↑ Sarkar C, Basu B, Chakroborty D, Dasgupta PS, Basu S (May 2010). "The immunoregulatory role of dopamine: an update". Brain, Behavior, and Immunity. 24 (4): 525–8. doi:10.1016/j.bbi.2009.10.015. PMC 2856781 . PMID 19896530. ↑ Silverman MN, Pearce BD, Biron CA, Miller AH (2005). "Immune modulation of the hypothalamic-pituitary-adrenal (HPA) axis during viral infection". Viral Immunology. 18 (1): 41–78. doi:10.1089/vim.2005.18.41. PMC 1224723 . PMID 15802953. ↑ Andrews NC (May 2004). "Anemia of inflammation: the cytokine-hepcidin link". The Journal of Clinical Investigation. 113 (9): 1251–3. doi:10.1172/JCI21441. PMC 398435 . PMID 15124013. ↑ Bhowmick NA, Chytil A, Plieth D, Gorska AE, Dumont N, Shappell S, Washington MK, Neilson EG, Moses HL (2004). "TGF-beta signaling in fibroblasts modulates the oncogenic potential of adjacent epithelia". Science. 303 (5659): 848–51. doi:10.1126/science.1090922. PMID 14764882. ↑ Wilson JX (1984). "The renin-angiotensin system in nonmammalian vertebrates". Endocrine Reviews. 5 (1): 45–61. doi:10.1210/edrv-5-1-45. PMID 6368215.